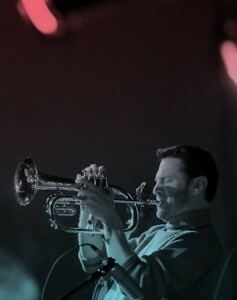 Jerry Sabatini earned a Masters Degree in Contemporary Improvisation as a trumpet performance major from the New England Conservatory of Music in Boston in 2009. He studied jazz, world and experimental improvisational music, personal style, and composition with Ran Blake, Anthony Coleman, Peter Row, Frank Carlberg, Allan Chase, Dominique Eade, David Harris and Charles Schlueter. In 2009 he was the featured soloist for the premiere of Anthony Coleman’s, Jeder MiBbrauch wird bestraft for trumpet, jazz piano trio and three Mbiras at New England Conservatory’s Brown Hall. He graduated with honors and was nominated for the Pi Kappa Lambda National Music Honor Society. In 1995 Jerry founded the jazz septet, Sonic Explorers, which he currently leads, performs on trumpet and flugelhorn as well as composes and arranges the band’s repertoire. In that same year, Sonic Explorers were premiered at the Discovery Jazz Festival in Burlington, VT. Their sound encompasses a wide range of instrumental styles and moods including traditional to modern jazz, funk, rock, avant garde and experimental music, as well as Eastern European and Asian folk and classical music traditions. The band has released four independent CDs (Birth of The Kakalla – 1996; Beatnik Oblivion – 1998; So Far, So Near – 2002;Lore of The Land – 2007 all on their label, NadaBrahma Records). In 2007, Jerry was recognized as a finalist in the Massachusetts Cultural Commission’s Music Composition Awards where he featured three compositions from Lore of the Land. Sonic Explorers can be heard performing in festivals, clubs, concert halls and on the radio throughout the east coast. Jerry also leads and co-leads several other projects including Roving Soul, a trio with Jerry on trumpet and flugelhorn, Chris Veilleux on saxes and flute, and Greg Loughman on acoustic bass. This band features mostly original compositions and arrangements of ethnic folk songs carefully prepared by the members of the band. They have released their debut CD, Bootleg Bakalava in the winter of 2011. Angels and Artifice is an experimental improvisational trio with Jerry on trumpet, voice, and auxiliary “sound-making objects”, Chris Veilleux on alto and soprano saxes, flute, Turkish nay and voice, and Mike Connors on percussion and voice. This trio features extended group and/or solo improvisations using short composed instrumental and spoken word “vignettes” as points of departures and segues. Iskar is a quartet that channels elements of jazz, Balkan music, electronica, and progressive rock into a modern free jazz jam band format. Iskar features Jerry on trumpet, Mike Connors on drums, Greg Loughman on bass and Phil Sargent on guitar. As a sideman, Jerry performs regularly with guitarist, pianist, and composer Mark Marquis whom he has recorded with on four of The Mark Marquis Group’s independently released CDs; Above the Clouds (2000), The Invisible Ray (2002), And We’re Always Glad You’re Here (2008), and Right Place Right Time (2009). He also performs regularly with the Boston-based ensemble, Makanda Project featuring the music of the late jazz woodwind player, composer, and Roxbury native, Makanda Ken McIntyre. Led by Boston pianist, composer, and arranger, John Kordalewski, the 12-piece ensemble is dedicated to continuing Makanda’s legacy through the performance of his music – specifically, by playing compositions which Makanda never had the opportunity to record or perform in public. An enormous body of such work exists, reflecting the full range of Makanda’s imagination as a composer. Jerry is a regular member of Charlie Kohlhase’s Explorers Club, Garrison Fewell’s VDSO (Variable Density Sound Orchestra) featuring the late John Tchicai, Boston’s Jazz Composers Alliance Orchestra, Eric Hofbauer’s Infrared Band, Ken Field’s Revolutionary Snake Ensemble and Mehmet Sanlikol’s Turkish/Jazz projects under the name of DUNYA. He has also worked among some of the greatest internationally known improvisers and composers such as Oliver Lake, John Tchicai, Odean Pope, Warren Smith, Fred Frith, Elliot Sharp, Anthony Coleman, Carl Grubbs, Frank Lacy and Turkish guitarist Erkan Oğur. Jerry’s past projects include co-founding and working with Kakalla (1998-2003) an original jazz quartet led by NYC bassist and composer, Thomson Kneeland, featuring NYC guitarist, Nate Radley and drummer Mike Connors. Kakalla has released three CDs featuring Kneeland’s compositions. They are The Voice of Blood (2001), The Voice of Silence (2002) and Seeds of Analog Rebellion (2005) on Weltschmerz Records. Jerry can also be heard on two recordings of the avant guard pop group, Combustible Edison (Schizophonic! (1996) Sub Pop Records (SP313) and The Impossible World (1998) Sub Pop Records (SP431)). Jerry directs small and large jazz ensembles, teaches music theory, composition, arranging, improvisation, and trumpet at Cushing Academy in Ashburnham, MA, The Joy of Music Program in Worcester, MA, Indian Hill Music Center in Littleton, MA and from his home studio in Leominster, MA. He is a frequent clinician, guest director, artist-in-residence, and commissioned composer for many New England colleges and universities as well as elementary and secondary schools including: The Longy School of Music, The University of Maine at Augusta, Worcester Polytechnic Institute, Clark University, Worcester Academy, The Groton School, Burncoat High School, Applewild School, Tahanto Regional High School, and Hollis-Brookline High School. Most recently, Jerry directed the Central District Massachusetts Music Educators Association’s Senior Jazz Ensemble in the winter of 2011 where he was commissioned and premiered an original composition, Tune Formerly Known as Prince (Albert), and an arrangement, For The Sun (That Never Sets), a tribute to the early music of Sun Ra. Other musical influences include: Miles Davis, Freddie Hubbard, Lee Morgan, Woody Shaw, Don Cherry, Don Ellis, Henry “Red” Allen, Cootie Williams, Dave Douglas, John Zorn, Tim Berne, Jim Black, Cuong Vu, John Coltrane, Wayne Shorter, Stan Getz, Bill Evans, Keith Jarret, McCoy Tyner, Herbie Hancock, Chick Corea, Art Blakey, Sun Ra, Ran Blake, Anthony Coleman, Charlie Schlueter, Frank Carlberg, Fred Frith, Elliott Sharp, Frank Zappa, James Brown, Aretha Franklin, Stevie Wonder, Ravi Shankar, Nusrat Fateh Ali Khan, The Bulgarian Women’s Choir, Huun Huur Tu, Maurice Ravel, Claude Debussy, Dimitri Shostakovitch, Bela Bartok, Phillip Glass, Lou Harrison, John Cage, Morton Feldman, Earle Brown, and Cornelius Cardew.